Before you pack up the car and set out for that trek through Yellowstone or Glacier Park, pack up the Talkabout T605 from Motorolla. The completely waterproof design helps you communicate with your group as you’re kayaking down some serious rapids. Make sure you’re ready for any emergency thanks to the advanced warning systems and weather alert functions so that no matter what you and your fellow adventurers run into, you can all stay in contact and just enjoy the trip. 22 channels and 121 privacy codes give you an impressive 2,662 combos so you can always find an available channel. 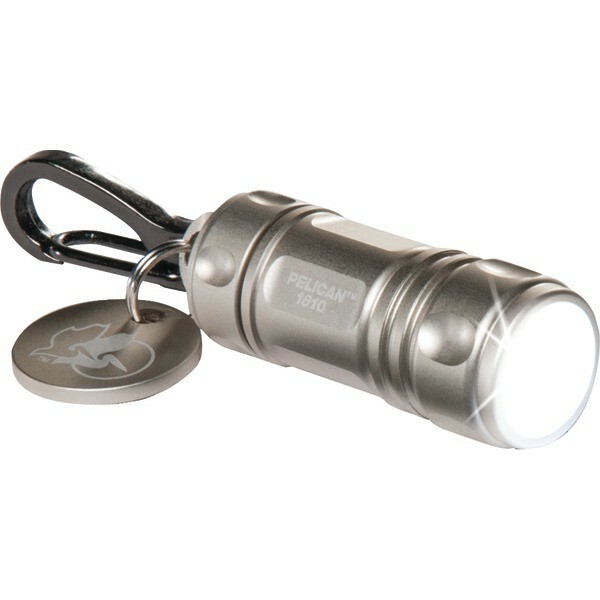 LED Keychain Flashlight is useful to help in everyday situations like Flat tires, missing headphones, needle in a haystack, you name it.The Pelican 16-Lumen ProGear 1810 LED Keychain (Silver) is an everyday personal flashlight will help you in the outdoors its handy keychain attachment 16 lumens of light . This smallest flashlight can easily clip on a backpack or store inside a medical kit or carrying it on hand or any other situation where quick illumination is needed. When you’re free climbing, the last thing you want to do is answer the phone. iVox/Vox feature turns the device into a speakerphone instantly, allowing hands-free communication. Answer a call and keep on moving, whether that’s up the side of a rock face or down the backside of the mountain. The last thing you need is to lose your radio if it takes an unplanned dip into the ocean, lake or river. The bright casing is not only waterproof, it also floats face up so you can easily find it and retrieve it. The water activation feature turns on the flashlight automatically, so you don’t have to go hunting for it at night. The T605 can handle constant submersion up to 1 meter for 30 minutes, so it can easily survive heavy rains while you’re out hiking or fishing. Choose from 20 call tones so your friends and family hear a customized ringtone whenever you call them. Use the VibraCall setting so you can get calls without scaring away the fish. Normally, you don’t have a lot of time to shout “Help! Bear!” Should that unfortunate circumstance arise, use the Push-To-Talk power boost extends your transmission range only when you need it. You also conserve battery life when you have the power boost option turned off. Includes 2 radios, 2 whistle belt clips, PSU with “Y” charging adapter wtih dual micro USB connectors, car charger with 2 USB ports, 2 USB charging cables & user guid. When it comes to powering your radio, you have to choices. You can use charge the included NiMH batteries which can run up to 9 hours. Should those run down in the middle of nowhere (aka your favorite places on earth), pack up three extra AA batteries and run it for another 23 hours. Charge up the NiMH batteries by connecting the USB connector to a vehicle adapter, your computer or the included electrical charger. You can also enjoy a longer charging life with an extended battery (sold separately). When you do need a charge, the low battery alert kindly and quickly reminds you. Some of the members of your party didn’t get the memo and brought their own radios? No problem. 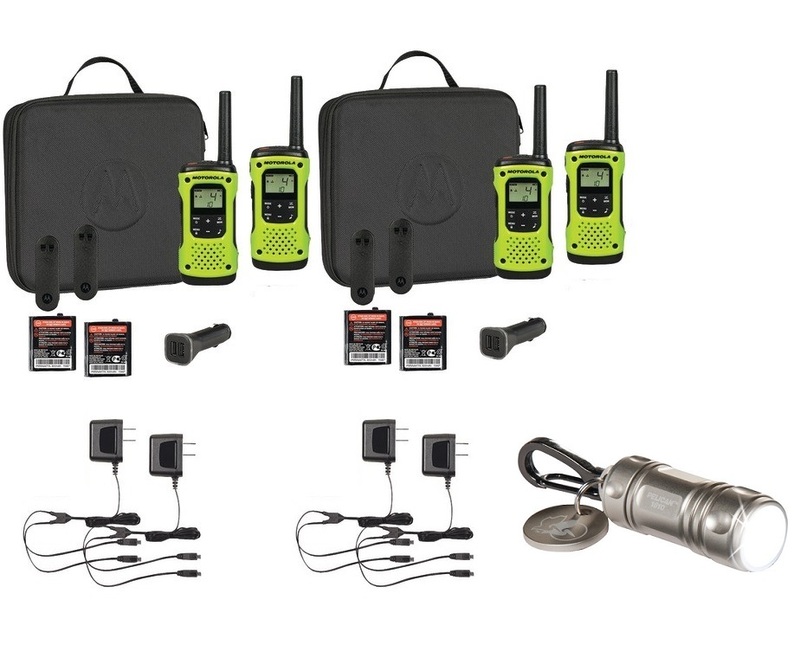 You can use the T605 with any FRS/GMRS radio on the same channel with the same privacy code. Turn on the scanning feature so you can instantly find an active channel that’s being used. Turn on the keypad lock so no one can hack into your radio and mess with your personalized settings. Stay in-the-know with real-time weather forecasts and condition updates from one of the 11 embedded weather channels and turning on weather alerts via the NOAA weather service. Not sure if it’s available in your area? Check with your local weather offices for frequency info: www.weather.gov/nwr. Canadians, go to www.msc.ec.gc.ca/msb/weatherradio.